Hello everyone and welcome to this week’s blog. This week we will discuss how to create and utilize filters for your research. Filters are a great way to identify target areas that meet multiple conditions. You want to identify areas of San Antonio to market your afterschool program that is aimed towards low income and low educational attainment areas. You can use a data filter to help find the target areas. 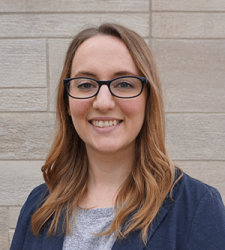 The SimplyAnalytics team would like to congratulate Rachel Holder, MLS candidate at Indiana University for being selected as this year’s recipient of the BRASS Student Travel Award! The award, sponsored by SimplyAnalytics, includes a $1,250 monetary prize given to a student enrolled in an ALA accredited master’s degree program to fund travel to and attendance at the ALA Annual Conference and a one-year membership in the Business Reference and Services Section (BRASS) of the Reference and User Services Association (RUSA). Holder has successfully applied her coursework, her practical experience at Indiana University’s Business/SPEA Information Commons, her two internships, and her work as a graduate research assistant. Her major focus as the business library intern has been spearheading the implementation phase of a project to expand career research consultations to another library on campus. In addition, she serves as the elected representative of the Department of Information and Library Science to Graduate and Professional Student Government. For more information on the BRASS Student Travel Award, visit RUSAUpdate.org. In this week’s blog we’ll take a look at how to enter an address in SimplyAnalytics to find the Census Block Group or Census Tract. Let’s get started! Use Case: You want to analyze the area surrounding your retail store or proposed restaurant location. 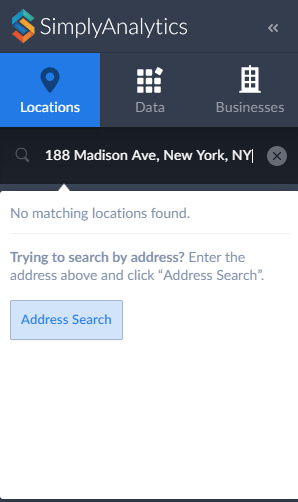 A message appears asking if you are entering an address – click on the “Address Search” button. We are looking forward to attending our first Electronic Resources & Libraries (ER&L) conference in Austin, TX! Visit us at Table #510 for a closer look at SimplyAnalytics – the best-in-class analytics and data visualization software for academic, public, and other libraries. We hope to see you there! We are looking forward to sharing SimplyAnalytics with the public library community at the upcoming PLA 2018 Conference in Philadelphia, PA. Our team will be exhibiting in Booth #855. Visit the booth to see what we have been talking about – we’ve taken the best functionality from SimplyMap, our award-winning geographic analytics application, and combined it with 10 years of experience and customer feedback to create the best-in-class analytics and data visualization software for academic and public libraries. While you are visiting, don’t forget to enter our sweepstakes for your chance to win a $100 Amazon gift card! We hope to see you there. We are looking forward to attending the annual SCELC (Statewide California Electronic Library Consortium) Vendor day, at Loyola Marymount University in Los Angeles on March 8th. In addition to exhibiting all day, Steven Swartz will give two presentations demonstrating the great new look and powerful data visualization capabilities of SimplyAnalytics. This session will include a live demonstration of SimplyAnalytics, our easy-to-use business analytics and data visualization tool. We’ve taken the best functionality from SimplyMap, our award-winning geographic analytics application, and combined it with 10 years of experience and customer feedback to create the best-in-class analytics and data visualization software for academic and public libraries. Stop by our table and say hi, or attend one of the presentations! They will start at 1:40pm and 2:30pm. The SimplyAnalytics team will be exhibiting at ALA Midwinter in Denver February 9-12. Stop by booth 2152 for a visit and a tour of SimplyAnalytics, the best-in-class analytics and data visualization software.. We hope to see you there! The SimplyAnalytics team is looking forward to exhibiting at the Ontario Library Association Super Conference 2018! Stop by the SimplyAnalytcs booth (115T) and take a look at our newest offering – SimplyAnalytics Canada. We’ve taken the best functionality from SimplyMap, our award-winning geographic analytics application, and combined it with 10 years of experience and customer feedback to create the best-in-class analytics and data visualization software for Canadian academic and public libraries. Good afternoon, readers! This week we’re going to talk about project management in SimplyAnalytics and how to best take advantage of it. Many users have multiple unique projects going on at the same time. For example, you could be doing: personal research, patron/student assistance, research for a presentation, etc. Projects help keep these unique activities separate from one another to avoid confusion. What is stored in each project? All of the locations, variables, business searches, favorites, views, etc. that you use are saved with the project – so each time you login, you can pick up right where you left off. The first recommendation we have is to rename your project. You can do this by selecting the “New Project” default title towards the top left of your screen.